This is an extremely long post and a sharp deviation from this site's usual content. In fact, it is more of a manifesto than a blog post. The internet is full of whacky videos and rah rah speeches. Not that there is anything wrong with this but after awhile, everything starts to look and sound the same. When I started this site, my desire was to share the lessons I have learned as an entrepreneur over the past several years from successes and failures. The question of how much to reveal and what to conceal kept me up at night. So, I decided to play it safe, but I can no more. This post tells the story behind story and my 20 year journey to arrive at clarity. My hope is you find something in this text that will help you do the same. Put on your seat belts. It's going to be a thrilling ride. 1. Go to and from school only. 2. Sit at the dining room table alone from the minute I arrived home until bed time. Leave only to go to the bathroom. 3. Do anything else I liked so long as did not leave the location. At first, I thought I got off easy, considering the seriousness of my violation. No, I'm not going to tell you (okay, he caught me smoking weed). I was defiant. I would remain at the table as instructed, but I would do absolutely nothing. I'll show him! Yeah I really showed him. My dad was a smart guy, and knew exactly what he was doing. The clock started ticking. Minutes, hours and days dragged on slowly, like being forced to watch a snail crawl through sand. This is when I realized the importance of human interaction. Although an introvert and a loner as a kid, self imposed solitude is a lot different than forced confinement. The difference being in the former, one can step out anytime and get all of the contact they want, and then retreat when desired. When the overwhelming desire for human contact so overwhelms an individual with no means of fulfillment, pain is the result, both mental and physical. It did not take long before I felt this pain. I gave in and decided I needed to do something, anything, to make it go away. A prolific reader, my father had a wall covered in books, mostly fiction from what I remember. I took one off of the shelf and started reading. Over the next several weeks, I devoured one after another. For hours each day, I travelled well beyond the confines of my home, my town and in some cases, my own galaxy. Worlds I never knew existed flooded my imagination while both awake and during sleep. Authors became Rembrandts with words as their paint and pages as their canvases. We all have access to the same words and paint, but the artist constructs them into stunning works of art. After weeks of dashing through book after book, I craved more variety. I grabbed a pad and pen and started writing.... and writing...and writing. From poetry to short stories to jokes and even random scribbles, nothing was off limits. Once I started, I could not stop. No longer a tool for passing time, writing had become an obsession. Daily I returned to the place of my confinement with the enthusiasm of a kid on the first day of summer. Instead of stepping into the worlds created by others, I discovered I could create my own. This was the greatest breakthrough of my childhood, and perhaps a prelude to my future as an entrepreneur. Throughout the rest of my days in high school, I wrote daily, for I could not stop, nor did I want to. Any opportunity to practice and get feedback I welcomed, including the school newspaper, poetry contests and the annual student poetry book. I had found my calling and the path was clear. I would dedicate my life to this art and one day become a best selling author. Laurie: "Have you written your great novel yet?" Me: "No great novel yet, but there is still time." Laurie is a good friend of mine from high school. We graduated in June of 1988 and reconnected on Facebook in 2009. Somehow, she remembered a significant moment in my life. A promise to myself I had long since forgotten. The day of graduation I told her I would one day write the great American novel. How did I forget something so important? Instead, I went on to start businesses and design directory systems for large companies, migrating data from here to there, proud of slaying complex IT projects. Oh, I continued to write. In fact, my documentation garnered compliments from clients and colleagues alike. "I have never seen a proposal so well written." "This is the best training documentation I have ever had." "Techies and engineers don't write like this." Such were the common responses to my written technical work. The one area no other techie could touch me because techies hate writing. I used this to my advantage to win contracts and out do my competition--a successful strategy for many years. On more than one occasion, I was told, "You should write a book." My response? "Nah, I don't really have anything to write about." The declaration I made back in high school lay dormant in the recesses of my mind. I always expected to one day do something different--something with purpose as part of my "grand plan." To get there I would build a "golden bridge," the perfect set of circumstances to move me from a life of necessity to one of fulfillment. The exact purpose remained a mystery, but I was confident I would get there. Becoming an author was nothing more than a distant memory, similar to a dream one vaguely recalls. The materials for my bridge would come from my efforts as an entrepreneur. I would work my tail off today in order to construct my bridge tomorrow. Then, I would march across in sweet victory into what I referred to as my "second life." Indeed this bridge would eventually arrive, but it would not be paved in gold. This business thing proved to be too easy. I had my share of difficulties, but I soon hit my stride. Sales came easily, customers were pleased and work was plentiful. My wife and kids radiated happiness and a sense of security I wished all could experience. This encouraged me to push harder and faster in pursuit of, not things, but more peace of mind. In order to be effective in battle, I needed my family to be safe. She sighed deeply as she said, "Two months from now?" "I'll see you in two months." "A person driven by faith, hard work and a laser focused purpose can achieve almost anything." Over the years, my wife and I grew into the quintessential example of the mastermind alliance--two or more minds with a singleness of purpose in pursuit of a chief aim, and the pursuit was going well. Do I need the golden bridge after all? "Have you written your great novel yet?" "No great novel yet, but there is still time." Without warning, Laurie shook me out of a 20 year slumber. I said that didn't I? In an instant, the words I uttered at graduation came rushing back to me. Somewhere along the way life just happened, my "calling" reduced to written maintenance procedures, training documentation and sales proposals. Laurie's words did something and to this day, she has no idea. She is learning for the first time, along with the rest of you reading this, the impact of those words. Over the next couple of years, a small voice inside of me grew louder and louder, and I became disenchanted with the career and business I once wore like a badge of honor. Once awakened, this voice would not rest until I gave it the attention it craved. Despite my best efforts to quell the noise, the demands would increase over time. The so called great recession showed no signs of letting up, and I did everything in my power to turn things around. Yet, a glaring contradiction accompanied my every action because inside I had grown dispassionate with my work. Then, something unusual started to happen. After overcoming one obstacle after another, and I had no shortage of them, I found myself saying, "Wow, I should write a book about this." Certainly, someone can benefit from the crap I'm going through! Without warning random book titles popped into my head. This happened so often I started writing them down. Some of them made no sense at all and had no obvious connections to anything in my life. For fun, I started using them as passwords. In fact, I use one of my favorites as the password for most of my online transactions ;-). Good luck trying to guess. Not even my wife knows. The thought of writing books had been long wiped from my consciousness. Why now the sudden appearance of odd book titles? The voice again, with demands becoming more difficult to ignore. Many days I sat in my office late in the evening after hours of grueling work, when book titles and unrelated verbiage appeared, interrupting my train of thought. Like being back in high school studying for finals while my little sister threw spit balls in my direction. Sometimes I became so annoyed, I wanted to tell my brain, "Go to your room!" If I did not get this stuff out of my head, nothing would get done. Therefore, I started recording these random thoughts with a voice recorder, unsure and uninterested in what it all meant. All I wanted was to focus on the more important tasks of the day. I wonder if this is what addiction feels like. Nothing else matters until one satisfies the urge, which is exactly what this felt like. We all love the background noise of the radio and television as we move about doing our weekend chores. God forbid we turn off that crap for even a minute to pay more attention to the stuff floating around inside of our own heads. On one of these occasions, a few weeks after my chat with Laurie, this background noise caught my attention. The exact details are vague now, but a male host discussed the over confident and adrenaline seeking nature of presidents and pilots. According to his analysis, great tragedies along with great triumphs were often the result. He concluded that it takes an odd and distinct personality type to believe they are qualified to be President of the United States or a fighter pilot during war. The level of confidence bordered on delusional. I burst out laughing and said to myself, "Sounds like you're talking about entrepreneurs. 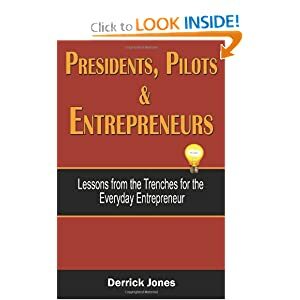 The show should be called presidents, pilots and entrepreneurs." Then, I thought, Hmm, I should write that book one day. This was the first time in over 20 years such a thought invaded my conscious mind. I laughed it off and went back to my chores. As I sat alone in an office space I could no longer afford, it felt like one of the worse days of my life. My business partner had bolted. The love of my life voiced doubts about my ability to turn things around, and once loyal customers no longer returned my calls. Budgets had been slashed up and down New York State. My last remaining confidant did his best to put on a brave face. He said to me one day, "Man, I am not going to leave you in the lurch like the last guy. We are in this together." His tendency to wear his heart on his sleeve, and my uncanny ability to read people made all of his attempts to conceal his true emotions pointless. Yet, we both pretended not to notice. The worse part of the day came down to one word: loneliness. What hurt the most was having no one to confide in. Not because of a lack of people in my life who care, but because so few could understand, except of course other entrepreneurs. The last thing I wanted was to dump my problems on someone else going through the same thing or worse. I sat in psychological confinement and needed to do something, anything, to make the pain go away. Then, I remembered the background noise--the report about presidents and pilots; the random book titles; the senseless verbiage flooding my thoughts. I knew of only one way to ease this pain. I finally gave the voice permission to speak and speak it did. In fact, it roared. "It's about time man! Now get out of the way! You're blocking my view!" Get out of the way is exactly what I did. For the next couple of hours I watched in awe as the words flooded the screen, pausing only to nod in approval every so often. Words became sentences, sentences became paragraphs and paragraphs became pages and pages and pages. The worries of the day were forgotten, crowded out by the magical strokes that filled my canvas. I went from being lonely to being alone; from confined to meditative. The thoughts flowed from my mind, down through my finger tips and on to the screen until I completed the book's introduction. A therapeutic shot in the arm for the struggling entrepreneur. This psychological brain dump ended with a high unlike anything I ever experienced. Then, I made a decision. Never again, if I could help it, would an entrepreneur sit alone in an empty room with no one to confide in, questioning their place in the world. Instead, I want them to pick up the introduction and read it again, and again, and again. This would serve as a boost and reminder of what makes them special. To stop here, however, would be a disservice. I also needed to warn those who approach this prestigious club of go getters and risk takers of what they were getting themselves into. Not to discourage them, but to prepare them and help make their journey easier. Another more important outcome resulted from this experience. No longer could I claim I had nothing to write about. This was the moment of clarity. I found my golden bridge. It was not paved in gold and there would be no victory march. Its construction of materials more precious than gold and more sturdy than ego. Blood, wounds and tears--just the right set of circumstances to give power to an inner voice long considered dead. I planned on writing this book. I would not seek the permission of publishers, nor the approval from my peers. This book needed to be written now, and I needed to write it. How everything came together is nothing short of miraculous, including how I found my editor. She is a publishing insider with over 20 years of experience and 29 best sellers to her credit. That is a story I will save for another time. To arrive at this place took me over 20 years, but now I know what I must do. I will do no chest beating or the typical entrepreneur bravado of achieving this and overcoming that or bending the arms of reality. However, I will tell you this. I have walked across my golden bridge, and only God knows what awaits me in the end. Some will say, and they already have, isn't this a radical decision? Can you make a living doing this? To which I say, are there not others already making a living doing this. Why not I? Why not you? The real question is what are we willing to do? How far are we willing to go? What things are we willing to give up today to attain a larger purpose tomorrow? If it means shoveling coal in the middle of the night to free up my day to focus on this purpose, so be it. The temporary pains of today are well worth the pleasures of tomorrow. I'm not going to tell you to quit your day job or "throw caution to the wind" to "follow your dreams." What I will ask of you is this: stop and think. Quiet your mind and think deliberately and intently. Only then will you find the right questions that will bring you to the right answers. "No novel yet, but there's still time." The little voice will awaken and it will ask the questions. From then on, nothing will be the same, no matter how hard you try. I am not going to ask you to share your thoughts in the comments, or tweet this article or share with your friends on Facebook or any of the typical blog promoting requests. I'm not even going to ask you to buy my book. This piece is about something much deeper. My hope is a word or two will be enough to cause you to pause and consider your own golden bridge. Are you still waiting for it to arrive or did you walk right by without noticing? Did you approach nervously only to turn back because it was not made of the materials you expected? I believe all us are born with unique gifts that make us special--something meant to help fulfill a special purpose. Not to be a great orator, world leader or Nobel laureate, but something whether major or minor (by our human standards) to impact someone or something along our path. We are responsible for choosing how we use these gifts. To save the life of a certain person on an operating table; to talk a young girl out of suicide; to make a young fatherless boy study at 4 in the morning so he could one day grow up to be President. Or perhaps to confine a 14 year old kid at a table for months on end to bring out the artist inside. People have asked me, "So, what's your next startup? Any great ideas?" Well, I must admit. I still have an insatiable appetite for all things startup and I love entrepreneurs but now my focus is different. My purpose on this planet is to serve others primarily through my words and any secondary means that aids the larger mission. If through another startup, that's great? Volunteer work? That's fine too. Or maybe doing whatever it takes to better serve humanity with my primary purpose or a combination of all of the above. The mechanism is not as important as the intent or the outcome. What is important is that I have crossed my golden bridge and I am not turning back. I pray you find and cross yours as well, for someone is awaiting your arrival.